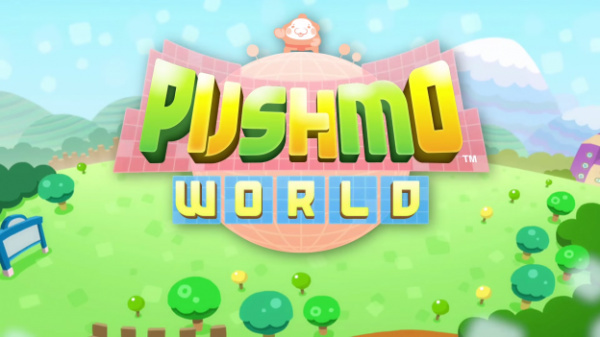 Intelligent Systems' Pushmo World (known as Pullblox World in Europe) is exactly what you'd expect it to be: a Wii U sequel to the popular 3DS eShop puzzle titles Pushmo (Pullblox) and Crashmo (Fallblox) that predictably adds shinier graphics, more modes, and way more puzzles. It's a very safe sequel that doesn't take many risks with the Pushmo formula, but high production values and always-clever puzzle designs keep it from feeling too stale. If you've never played the series, the puzzle-platforming concept is simple; as a sumo wrestling blob named Mallo – unfortunately not to be confused with Super Mario RPG's Mallow – you push and pull blocks to traverse block towers and save the children trapped inside. Since the blocks are different colours and aligned in a grid, often the puzzles are shaped like fun pixel art; there are no enemies or time limits, so it's a laid-back formula that lets you solve puzzles at your leisure. As the game progresses special gadgets are introduced like manholes that let you teleport between faraway areas in the puzzle, and "pullout switches" that automatically pull out every block of a specific colour. One of the few new additions is the "pushback switch," a natural counterpart to the pullout switch that pushes the blocks of a given colour back to their starting positions. True to its 3DS roots, Pushmo World sports a simple, clean art style full of pastel colours and cute characters; there's the same lack of variety in the backgrounds that was present in the original, which is strange given the Wii U's increased fidelity and horsepower. The menu music is a nicely varied collection of pleasant pieces, but once you get into the actual puzzle levels you'll listen to the same handful of songs over and over, many of which will be familiar to veterans; you'll get pretty sick of them after a while. 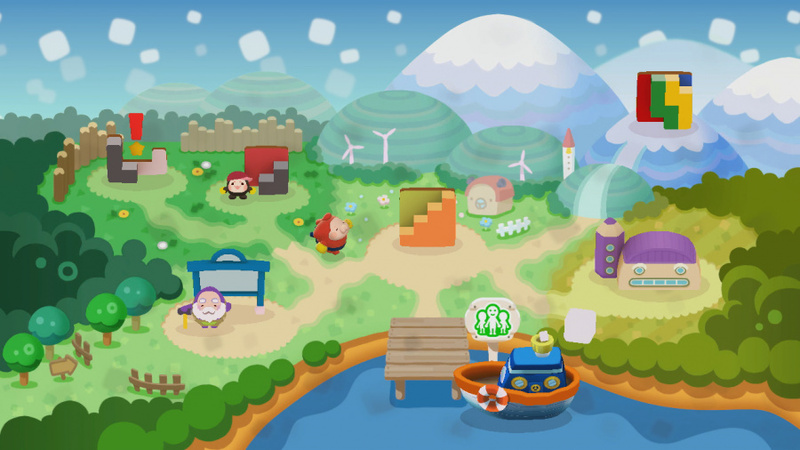 The rest of the game allows Mallo to walk around a little overworld to access the various game modes: Pushmo Park, Visit Papa Blox, and Pushmo Studio; additionally, Training Area, Mysterious Pushmo, and World Pushmo Fair are unlocked as you progress through the first few levels of the game. There's no multiplayer to speak of, and none of these modes are particularly surprising; this title plays it incredibly safe, as it leaves heaps of potential for building on the formula untapped. There could have been a competitive mode where players aim to complete puzzles in the fastest time or the least number of block moves, or multiplayer where opponents try to sabotage each other's puzzles. Alas, we'll have to wait for the inevitable Crashmo World for that – as far as establishing the franchise on Wii U goes, this is a solid foundation on which to build. Pushmo Park is the meat of the experience; it takes most of its cues from its namesake on 3DS, as the super-complicated three-dimensional puzzles from Crashmo are nowhere to be seen. That's probably a good thing, since Crashmo perhaps took the 3D block puzzle idea a bit too far. This entry sticks to the simpler, classic concept, and if you played the original you'll know precisely what you're in for: dozens upon dozens of clever puzzles and children to save. The elderly blob Papa Blox shows you the ropes and guides you through the first few levels of the main puzzle mode, as more advanced mechanics are slowly introduced step by step. You can leave Miiverse feedback on every single puzzle in the game, which is a fun Wii U addition to the series. Pushmo World controls beautifully: the left stick or D-pad for movement, B to move blocks and A to jump. The L button lets you rewind the game if you make mistakes, a returning feature from earlier entries in the series that comes in handy when you find yourself stuck on a puzzle. The R button shows you the puzzle in its entirety, which is nifty for larger puzzles, and the right control stick lets you move the camera around so you can see the three-dimensional puzzles better. Pushmo and Crashmo are arguably among the few 3DS titles whose stereoscopic 3D effect actually add to gameplay; it's a pity that Pushmo World can't replicate it, but the right stick for moving the camera suffices. The game utilises the perfect mix of button and stylus controls; you can't use the touch screen at all for the main gameplay, but you can use it to pause the game, navigate menus, and design puzzles in Pushmo Studio. Unfortunately this means there's no Pro Controller support; it's not a big deal as this is single-player only, but for a first-party title it's a surprising oversight. 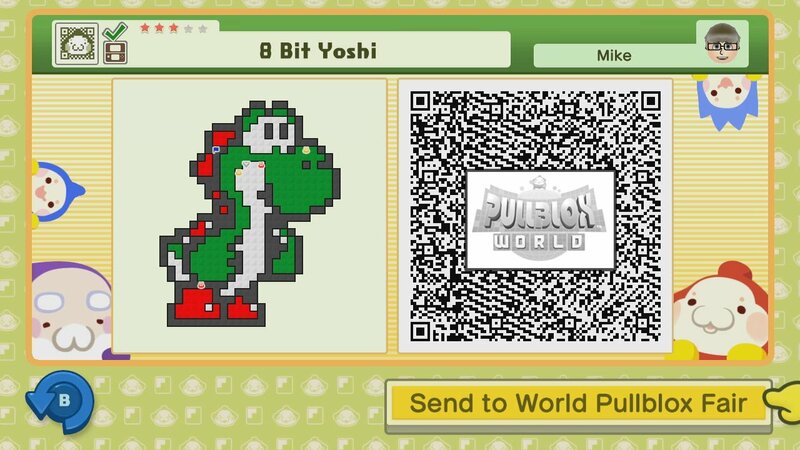 There are far more bells and whistles in Pushmo World than in its predecessor; when you visit Papa Blox he's got an options menu, detailed descriptions of all the game mechanics, a cutscene player, a music player, and your stamp collection full of Miiverse stamps you can unlock. Corin, the antagonist of Pushmo, is now a domesticated young blob who offers a tutorial area entirely separate from the main Pushmo Park collection – these puzzles are less about the pixel art and more about learning the intricacies of the different game mechanics, and if you get stuck in the tutorial levels you can talk to Corin and he'll show you exactly how to solve the puzzle. Once you've solved a few sets of puzzles in the Park, Corin will reveal a new mode for this entry: Mysterious Pushmo. This is a collection of abstract puzzles where entire colours of blocks move together; if you move pull one red block, all the other red blocks will pull out as well. This mode isn't as approachable as the basic Pushmo Park, but it's a nice twist on the block concept that will challenge veterans who find the standard puzzles too familiar. 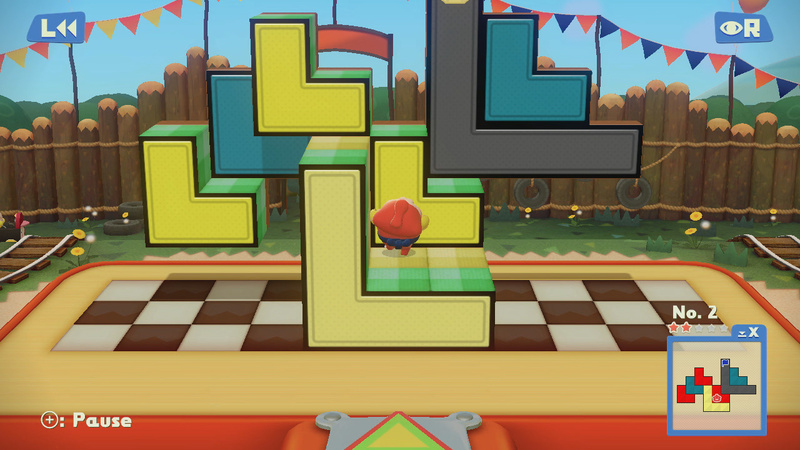 The other flagship mode is Pushmo Studio, where you can create your own puzzles. You've got every tool imaginable to make whatever sort of puzzle you want, and gadgets are added to the studio as you conquer levels that feature them in the main Park mode; it's an easy-to-use system that's not too overwhelming for newbies yet still maintains the huge feature-set that longtime fans will want. 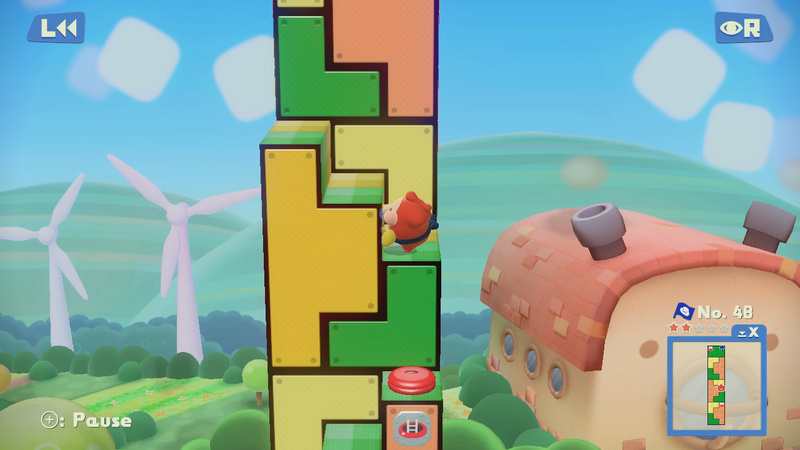 The same gameplay is always displayed on both the TV and GamePad screen, which allows for simple off-TV play, but it's a shame the TV couldn't be used to display a 3D preview of your puzzle as you design it on the GamePad. Pushmo Studio is sure to be where the game gets its longevity, as players can share and download each other's puzzles willy-nilly; you can create QR codes for your puzzles at the touch of a button, and you can even scan QR codes with the GamePad's camera. This leads into World Pushmo Fair, which is the Miiverse-integrated puzzle sharing service new to this entry in the series. With a much more comprehensive offering than the 3DS entries in the series, this is sure to please longtime fans, while compatible puzzles can also be enjoyed across platforms and series entries. Anyone who fancies a good puzzle will enjoy Pushmo World immensely. If you've never played one of these titles before, this is the most refined, complete iteration of the concept, and it's definitely the version to pick up. If you've played one of the other games before, there's not really anything new to see here, although hopefully the online community will produce fun content for years to come; aside from the familiarity, Pushmo World has no major faults. After the departure that was Crashmo (Fallblox), this is also a conservative, by-the-book sequel with that trademark Nintendo polish – you know what you're getting, but what you're getting is delicious. It's releasing already? Didn't Nintendo just recently announce it? Bought Fallblox last week, all ready for the special offer of Pullblox World. I wasn't expecting a review so quickly either, but the review is exactly what I expected. I can't wait to get stuck into this. I think Pullblox was the first game I downloaded when I got my 3DS. Still hasn't finished The 3-dimensional nature of the game makes sure some puzzles are unbelievably complex. One of the greatest puzzle-games ever, for sure. Slow down Nintendo! My Wii U is attacking my wallet all of a sudden! Mario kart 8, Swords and Soldiers HD, 1001 Spikes(awesome by the way), Mr Driller 2 GBA VC, now Pushmo World? Haven't played the old 3DS version and will absolutely get this on release. The Pushmo Studio feature sounds like great value. I'm really happy to se Nintendo continue with the franchise. Knew the review was coming as I have one of the GameXplain guys on my Wii U friends list and he was playing this like a day or two ago. I'll be getting this as I love Pullblox and Fallblox. Download size? It would be nice if NL would always include it on games preview page or in reviews. Can't wait to get this, I like the series. I really loved Pushmo, but having finished it I found Fallblox to be disappointing as most of the game seemed extremely easy. I only found the last 5th or so of the levels to be remotely challenging. Hmm, I liked them on the 3ds but not enough to buy this one. Maybe in a sale. Not a puzzle guy but I'm interested in the user made content sharing, I know some people are going to make some amazing things. I had my fill on the 3DS to be honest. Maybe if it introduced something new it'd be worth my money, but at least its not Crashmo. If there's a cheap sale I'll go for it I suppose. @outburst Hey there again outburst! Didn't notice it was you until I hit reply XD But yeah I agree, a file size would be nice. I could Compare it to Super Mario Galaxy 2: Really just an expansion on the original. That was quick. I still have to beat about 20 crashmo puzzles before I think about this. As much as I love the Pushmo/pullblox stuff, surely this is keeping Intelligent systems from making more Advance Wars? Would much prefer a new Advance Wars! Thanks! I'm definitely NOT buying it (for now) if it's 5gig. Hey. I forgot to thank you for the tip on the Wii U 5.0 update. I got crashmo now that it is on sale and I am in love with it. I prefer it over pushmo, actually. But i will get this one so I have them all. Very enjoyable review, anyone know when this is out in Europe? Yep, I'm only making fun that I won't buy it IF it's 5gig and in reply to my first post that I will definitely buy it. I just grabbed Pushmo when it went on sale and love it! I'll definitely get this one. Only problem w/the original was it was too hard to share levels. I'm really excited for this release, and actually glad the didn't include Crashmo as I personally didn't like it nearly as much. @luke88 June 19th in Europe, it's "Pullbox World" here. European Wii U users can get a cross-platform discount on this title. Awesome, I'm there! My daughter wasn't super jazzed enough for me to get her the 3DS game, but I expect she'll give this a go. it doesn't seem like they added enough to make me jump on this right away. i'll get it eventually, but still have some puzzles in pushmo and crashmo that i never got around to. looks great, i've got Pullblox and Fallblox on my NNID so i'll get this game at a discounted price! Looks good. I'll definitely pick that one up. That is, I will definitely download it! Well sounds solid, but I still haven't fully be it either of the two previous titles. I think I'll hold off on this. At least until they announce a discount or the cross-platform discount everyone else is getting. Seeing as I really enjoyed but never beat The original Pushmo, this game is definitely one I am looking out for. The "port-ish" nature of this game is forgivable for now, since it's all about cross-compatibility. Haven't you heard? Dillon is an assist trophy. I'd love to see a Pushmo inspired stage with warps being used and blocks being pushed/pulled to keep it exciting. Even though it's more expensive in Canada, I will get this in July so it counts towards next years rewards. The handholding in this is driving me insane. I am generally not one to be frustrated by video games, I can be stuck on puzzles for hours on end without feeling any form of anger, but the neverending tutorials and interruptions in this drove me bonkers. As the intricacies of the editor was painstakingly detailed to me in message after message after message delivered by my kindly old grandpa I felt myself tapping the screen harder and harder before starting to swear at the gamepad. On the plus side the game is good enough that I found it wildly infuriating to have these non-gameplay roadblocks... On the minus side you can't skip the tutorials or messages.